Mortally wounded Battle of Sharpsburg, MD. 17 Sept 1862 and buried in an apple orchard on Capt. David Smith's farm. Lt Speight's remains were moved to Hagerstown MD. by Mr B. Franklin Otto in 1907. This headboard was obtained by Fred. W. Cross on 20 Sept 1924 from Mr. Otto. The Bowie list has a page with soldiers who were "Buried in Capt. David Smith’s Orchard northeast corner were buried deep; the orchard has been plowed and graves plowed over, but can all be pointed out; some of the boards have been preserved at the house. Some unknown were also buried here." 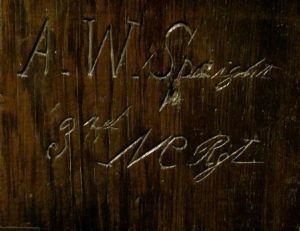 Among those was a "A. W. Spraight * 3d N.C." Coxson's list also includes a Spraight from North Carolina. However service records for 3rd North Carolina include a Speight. See the attached PDF. The service records were provided by Greg Farino and are used with thanks. The grave marker had previously been displayed in Doug Bast's Boonsborough Museum of History.